Vornado has a good reputation for manufacturing quality electronic stuff for residential purpose. Vornado 184 air circulator is one of the best inventions of the company. 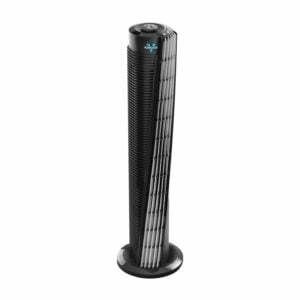 The unique contemporary design and V-air flow technology of this tower fan are the main reason why it creates huge hype among the people. This top quality tower fan can be used in a 250 square feet living or bedroom. This wonderful fan can make your body temperature suitable and make yourself cool in the hot summer. You can also use it along with your air conditioner unit. Running both the units ( tower fan and air conditioner) will save a lot of energy and save the electricity bill. Does this fan really suitable for you or not? Perhaps after reading this review of Vornado 184 air circulator fan will help you to find is it really worth to buy or not. The V-flow circulation technology of this Vornado fan coined this tower fan as the most efficient fan. A standard fan circulates the air in one direction in a line, but Vornado 184 creates a V shape air area to flow through the air. Thus, A very high volume of air flow in the whole room and circulate the cool air in the room. For this reason, this tower fan doesn’t need oscillation to cover the room. You can set the timer according to your need. Vornado 184 includes 2, 4 and 8 hours preset timer. In weakening, you are watching a movie in your living room. For example, You set the timer of the Vornado tower fan at 2 hours. The power of fan will automatically turn off whenever the running time of the fan cross over the preprogrammed time. Though you forgot to put out the tower fan. This way you can save the electric bill. Typical oscillating tower fan (like Ozeri tower fan, Dyson tower fan, etc.) wobble when the fan started oscillating. The base of Ozeri tower fan is very narrow and small, and most of the customers who bought Ozeri tower fan complain that this fan creates the wobble in such level that the fan drop on the floor all of a sudden. The base of Vornado 184 tower fan is very robust and sturdy. Also, this tower fan doesn’t oscillate. So, this tower fan is completely free of wobble, and the consequence occurs by wobbling of the tower fan. Thus, this tower fan is more durable in nature. The air ionizer feature will keep the air fresh by ionizing the air particle around the tower fan. The ionizer creates negative ions. These negative ions attract the dust, pollution particles and large air particle toward ionizer. The filter system in the air ionizer catches the unwanted air particles. Thus, these fans clean and purify the air around the fan. When you press the Oscillation/Ionization bottom twice it will activate the air ionization system of the tower fan. The good news is the air filter is removable and washable. So you can clean it or change it when it becomes dirty and likely the filter is very easy to clean. The motor of Vornado 184 is very powerful and efficient. The motor of this fan can produce an air flow of 500 CFM (cubic feet per minutes). This pushes the air movement up to 100 feet. So tower fan can quickly cover a big size bedroom or office. The remote control of this tower fan comes in round shape. This remote control is two and a half inches in diameter and only half inches in thickness. You can control the power, speed, and timer of the fan using this remote control sitting in a chair or laying in bed. You can control the fan with this remote though you are up to 15-20 feet away from the fan. This tower fan is silent in nature. The motor of Vornado 184 air circulator fan creates microscopic sound. I am using this Vornado fan in my bedroom, and it doesn’t create any problem. But if you set the speed of the fan at the highest level, at that time the noise will be the little bit annoying. The fact is that I rarely use this fan at most top speed. You will get five years of limited time warranty of this Vornado 184 whole room tower air circulator. You will get a card of guarantee with the box with the date it is purchased. We love the design of this Vornado 184 air circulator. The front grill of this fan is uniquely constructed with contour air vents. The body of this tower fan is made of stress-resistant plastic. The black color body with glossy silver color front grills gives it absolutely glittering color combination. This 41 inches tall tower fan is perfect for contemporary home décor. Without any doubt, it will be yield big WOW vibe in your home or apartment. The base is constructed such that it will reduce the wobble. This tower fan doesn’t oscillate like other traditional tower fans. The engineers of Vornado claim that the Vornado 184 is designed to distribute the air creating an angle of 90 degrees. But our testing team found that the angle will be closer to 50 degrees. The angle is enough to spread air in your room. Only you have to choose the right place in your room to circulate the air perfectly in the room. It will maintain constant airflow without feeling choppy. It is a perfect portable fan for home. The construction is excellent but not very heavy. A robust and sturdy carry handle increase the portability score of this fan. You can use it in your bedroom or livening room as a main cooling system. If you have an Eco-friendly air conditioner in your room than this Vornado tower fan will be best to use together. Basically, the fans of eco-friendly A.C flows the cold air only a few feet from the unit. Aim the air flow opposite of the air conditioner to get the best result. The outer construction of this Vornado fan is very sturdy and robust. As you know, the outer body is built with stress-resistant plastic. This 41 inches tall fan may appear unstable but ironically it is the superb stable unit. The inner parts also work perfectly for a long time. But some customers complain that their fan stops operating after 1-2 months. But, thankfully they got a 5 years warranty card. So, they place a report on the official website of Vornado and they help them to fix the problem. They solved the problem within a week. The customer service of Vornado is very responsive and supportive. At low and medium speed the sound is not very much noticeable. The motor of the tower fan creates little squeaking sound but it is endurable. In high-speed mode, it produces as much sound like a normal oscillating or pedestal fan. It is suggested to use it at low or medium speed mode when sleeping or watching TV. The CFM rating of Vornado 184 tower fan is 550 that is half the CFM value of Dyson AM07Air Multiplier Fan. With this 500 CFM, the Vornado tower fan can cover a room or space of 250 square feet. Vornado announced that the 184 model can move air up to 100 feet. But, we tested that it can move air 50 feet on the highest speed setting. So, they just over promoted the fan by advertising this feature. It has the capacity to affect the temperature of the room. We found that it will give you the feeling minimum 5 degrees Fahrenheit cooler than the actual room temperature displayed in the fan thermostat. For better performance we recommend you to place the fan 6 feet up front from any corner of your room. ♡ The remote storage unit is very attractive and easy to find. ♡ It takes only 5 minutes to assemble this tower fan. The assembly needs only four screws to insert in place. Carefully read the user manual of Vornado 184 whole room tower air circulator that is given with the box. ♡ The air flow speed of Vornado 184 tower fan is greater than Dyson AM07 tower fan. ♡ The construction of this tower fan looks sophisticated, but the fan is not very heavy. You can easily move it from one room to another. ♡ This Vornado tower fan is very easy to clean and you can clean it at your home without hiring any professional. ✘ This tower fan doesn’t oscillate. But it circulates the air well. ✘ At highest speed, you will hear the noise. ✘ It has the only 4-speed setting. So you have very little choice to change the speed. Dyson tower fan comes with a 10-speed setting. Every device has some lacking in nature. The Vornado 184 review also shows that it has some drawback. But these drawbacks are not deal breaker. So you can choice Vornado 184 air circulator for your home or office. The decision is entirely up to you.